While it is technically spring, this week has been cooler and rainy here in the Midwest, and I don’t know about you, but cool, rainy weather always makes me want a big bowl of soup! This soup is very flavorful and easy to throw together. As I mentioned last week, during my Daniel Fast, I typically made a big pot of soup at the beginning of the week and then ate it along with a salad for lunch throughout the week. This was one of the soups I made and it was delicious! In a large saucepan, sauté onions in olive oil until translucent. Add vegetable broth (use more or less broth depending on how thick you want your soup), black beans, tomatoes, corn and seasoning and bring to a boil. Reduce heat and simmer 20 minutes. Stir in cooked rice and refried beans and simmer for an additional 10 minutes or until the refried beans have dissolved into the broth and the rice is heated through. 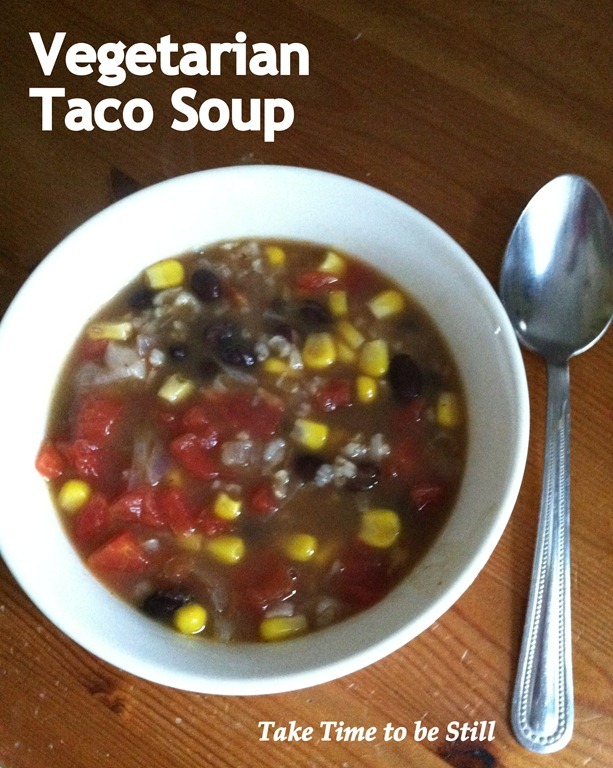 This entry was posted in Meal Planning and Recipes, Mommy Mondays and tagged Daniel Fast, Meal Planning and Recipes, mommy mondays, soup, vegetarian by Julia. Bookmark the permalink.